Some of the finest Contemporary Jewelry Artists can often be found right here in the American Southwest. 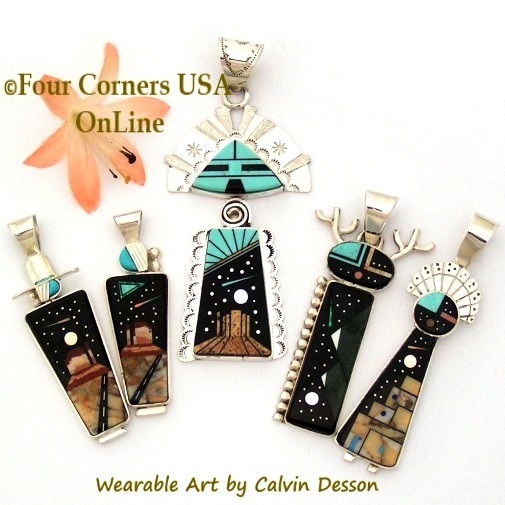 Native American Jewelers, Silversmiths, Designers and Inlay Artists may sometimes collaborate their finished creations and sometimes they incorporate their own special talents as with Navajo Artisan Calvin Desson. With minimal training and extraordinary natural talent, Calvin Desson takes his pencil to paper Art and decides to create in Stone. 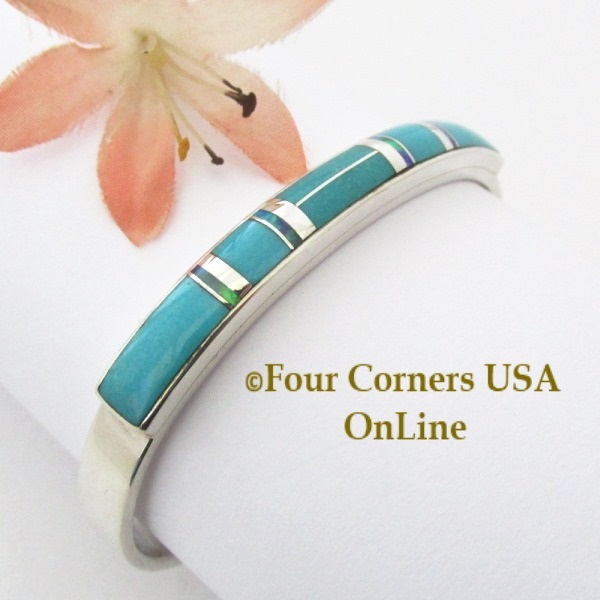 In addition to finding the Art of Navajo Calvin Desson at Four Corners USA OnLine you will discover some of the American Southwest's finest jewelers such as Albert Francisco, Marie Tsosie, Ernie Ohmsatie, Shiela Tso, Robert Vandever, Larry Chavez, Kenneth Bitsie, John Charlie, Cleo Kallestewa, Cathy Webster, and James Lee all showcasing traditional to contemporary modern design perfectly pleasing to the eye in fabulous colors. 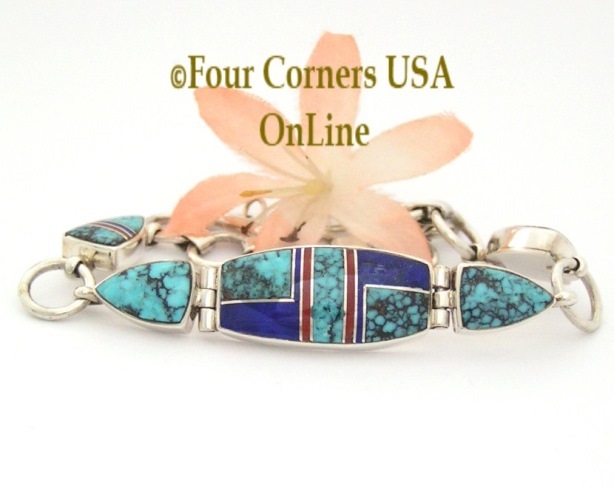 Here is a wonderful example of Zuni Animal Inlay. 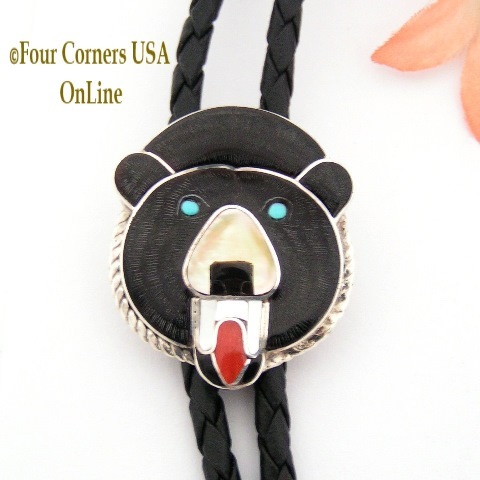 Beautifully handcrafted and painstakingly etched Black Bear Multi Stone Inlay Bolo. Exquisite detail of tiny etching to create a multi dimensional look in the fur of this wonderful Bear. Spiderweb Turquoise Fine Inlay Adjustable Link Sterling Bracelet Navajo Artisan Silversmith Shiela Tso Native American Jewelry. What can I say this collection is eloquent with the delicate Channel Inlay of blue/green Spiderweb Turquoise, a touch of Lapis and Coral in a well balanced grouping of five settings.